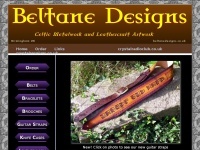 Celtic crafts belts, stainless bracelets, toolbags made by Geoff Roberts are handmade in Birmingham, UK. Look at the craftsmanship of Celtic art that Geoff brings to you. All the Celtic artwork is available and custom orders are welcome.